Charlie Heller is an ace cryptographer for the Company. He's a quiet man with a quiet job in a back office. But when terrorists shoot his fiancee in cold blood and Heller learns that the Agency has decided not to pursue those responsible, his life takes an abrupt turn. He was not a blackmailer but he will force the CIA's hand. He was not an assassin but he will penetrate the Iron Curtain with the intent to kill. Heller is an amateur with a one-in-a-million chance of success. Robert Littell has created the CIA "legends" Francis and Carroll - dubbed "The Sisters Death and Night" by their cohorts. But few know what these enigmatic and extremely dangerous operatives do. They plot - and they're plotting the perfect crime. They've located the perfect pawn, the Potter, the exiled ex-head of the KGB sleeper school - and, with artful deception, the Sisters coerce him into betraying his last and best sleeper, the man he considers his son. Once awakened, this sleeper, an assassin living secretly in the US, will launch a mission of death. An elite plan is afoot, a plan so secret and dangerous that its existence is known only to a tiny group of specialists within the innermost core of the CIA. There is virtually no paper trail - but somehow the plan has sprung a leak and the plotters must urgently plug it - or face deadly consequences. A Challenge and it's worth it! Before The Company, Robert Littell made a name for himself with The Defection of A.J. Lewinter. Hailed as "a perfect little gem" and a "concise, smart, and funny [novel that] turns Cold War spy cliches on their head," A.J. Lewinter tells the story of an insignificant American scientist whose defection to the Soviet Union becomes a terrifying political chess match of deceit and treachery. Not to be missed! Crisis constantly lurks around the corner, monitored by spies who are always with us. In his career-capping thirteenth novel, master of the espionage thriller Robert Littell has crafted a breathtaking story of the legendary CIA - "The Company" to insiders. At its heart lies a spectacular mole hunt involving the CIA, MI6, KGB and Mossad - a stunningly conceived trip down the rabbit hole to the labyrinthine Alice-in-Wonderland world of espionage, "a wood where things have no names." Racing across a landscape spanning the legendary Berlin Base of the 1950s - the front line of the simmering Cold War - the Soviet invasion of Hungary, the Bay of Pigs, Afghanistan, and the Gorbachev putsch, The Company tells the thrilling story of agents imprisoned in double lives, fighting an enemy that is amoral, elusive, and formidable. It also lays bare the internecine warfare within the company itself, adding another dimension to the spy vs. spy game. Littel has spun a tale so true-to-life that I found myself thinking it might be thinly veiled non-fiction. More than once I found myself sitting in my car, listening until the very last moment I could walk in to work. The characters are fully three dimensional, the plot develops naturally, and the history lessons contained within the story are so well woven I couldn't tell where the fiction ended and the history began. Don't miss this revealing look at the rise and near-fall of one of this country's governmental institutions. Full of twist and turns and surprises. This is one of the most complicated and deeply written plot, based on real people and historical events. While a novel, you soon forget that fact as the characters develop and the story unfolds. You have to pay attention, because the plot turns on itself, and you can loose the storyline. I don't know how many times I had to replay a section, because I missed a switch in the plot. Character development is great and you soon know and care about the characters. It is sometimes hard to tell who the good guys are and who are the evil ones. No matter, you will find yourself engrossed by the story. If you lived through some of these actual events, the book makes you wonder if it has let you in on what really happened and why things happened the way they did. I will definitely be reading more of Mr Litell's books. 2 Some said too long. I do like long books and felt that every hour was great. There was 1 slight lull in the 80's after a major plot climax, but overall, it was captivating. 3 Some got mixed up with names because of it being a spy novel. This was my biggest concern. I have the same problem. But I was able to be reasonably sure of what was going on at all times. 4 ...It was a condemnation against democracy. This is the most ridiculous claim. I didn't see any "preaching" for or against. It is a spy novel. The author showed that the Russian actually believe in their cause. Characters on both sides of the "game" were well developed and real. Spy novels aren't my genre, but I would recommend this book highly. I've never written a book review before because I would hate someone to buy something on my account and then not enjoy it. However, I can confidently state that "The Company" is a top notch listen in every respect. History has never been so entertaining or personal. I hesitate to imagine the hours of research that went into its writing, for, although it is a work of fiction, the factual events are covered in amazing detail that shows uncanny clarity and insight on behalf of the author. It is easy to get lost in the names, places, titles and relationships, but it is worth the effort. The narrator was perfect. His readings were well prepared (it is probably difficult to switch from German to Russian accents back to English), and he put real emotion in the reading when required (without overdoing it). 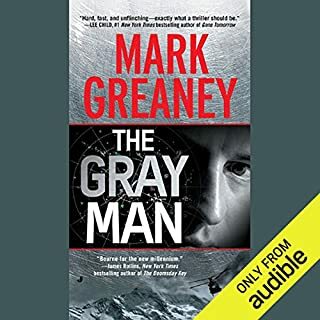 I can't really overstate how much I enjoyed this audiobook, and I am sure that you well also. The Company will become a part of your life. Over the course of a month I came to know the men and women depicted in The Company, and to care about them. This book is about more than just the cold war, it is about the shaping of modern America and the people who (could have?) made it happen. I didn't want it to end. This is the first review I have written and I just had to do it. I am about half way through the book and it's great! I really believe it is more true that fiction! I had reservations about downloading such a huge book, but I am enthralled. I was afraid that it would be too confusing listening to this type of book, due to both the subject and the length, but it is so interesting I can't wait to get time to listen to it. It is written in such a way that it is easy to follow and the narration is exceptional. What a great book! At 40 hours, this juggernaut of an epic pulls you deep into the story of the second half of the twentieth century from the perspective of the true soldiers of the Cold War. At 23, even relatively recent events like the fall of the Berlin Wall are shadowy memories at best for me. 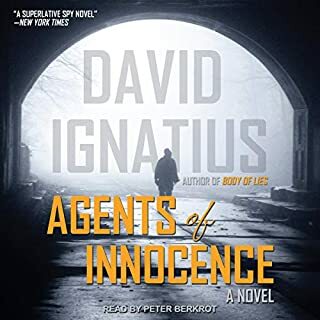 Littel brought the meaning and feelings of over forty years of tension straight to the surface with action, secret agents, double agents, love affairs, suspense, history, spectacular characters, and humor to slide you through smoothly. 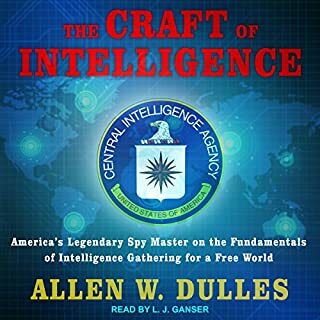 This audio book is a rite of passage to being a true Audible listener. Littell strikes a great balance between detail and drama. The story sweeps over decades and continents, but still keeps you connected to the three men whose lives are traced the most closely. When a major plot twist involved one of them, my heart actually started pounding and I became concerned for him. I highly recommend this entertaining book, especially if you take advantage of a subscription to pick it up for a song! What a fantastic listen, at no time did I think that 40 hours was too long: I found this novel interesting from start to finish and a great way to get a birds eye view of modern history. Littell's style has enough detail and originality of expression to engage the 'reader' without slowing it down too much for the listener who likes action. Definitely qualifies for a repeat listen before too long. The narrator was easy to listen to and characterised the voices very well without causing one to cringe. When I bought this book, I shelved it for a while because I couldn't commit myself to the sheer length of it. Everyday I didn't start listening to <U>The Company</U>, I was robbing myself of one of the greatest audio book experiences I will probably ever have. The depth of character development and the complexity of the interweaveing stories is handled masterfully by Littell. Scott Brick's narration is fantastic. Do not be intimidated by the length of this book! Once you get in, it will stay with you during your days and nights when not listening to it. Don't be daunted by the length of this book as it breaks nicely into sections/time capsules. I'm usually a fan of crime thrillers but I'll try anything that grabs my attention and then manages to hold it. 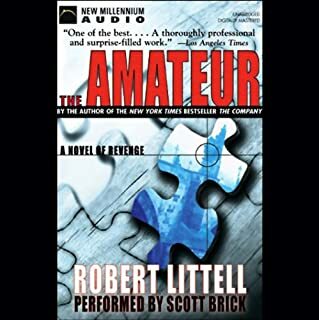 Littell's style and Scott Brick's performance proved to be a perfect match. 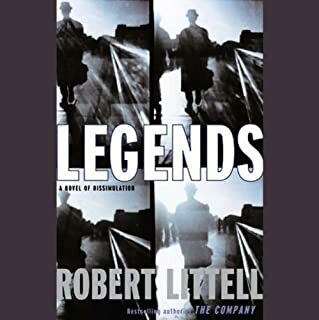 I was first attracted to Robert Littell after watching the TV series Legends on Netflix. My husband and I gulped it down in three evenings. I decided to see what was available by this author on Audible. Seeing the length of the book I was put off but thought what the heck if it doesn't measure up I can return it. I found myself riveted. At several points I went online to see how close the book followed recorded history, especially the Bay of Pigs and the Gorbachev/Yeltsin era. Except for the names of the fictional characters, the book closely followed actual events. Give this book a try even if it's not you're usual genre. The Company has taken me off into a whole new genre. Can't wait to read more from this author! 45 hours of engaging espionage.. If you could sum up The Company in three words, what would they be? The 'girlies' scenes throughout the book made me cry. The Company is nothing less than an epic history of the Cold War, the period in which the United States of America and the Union of Soviet Socialist Republics tried to undermine each other without resorting to nuclear weapons. Had me hooked straight away. An often uncomfortable journey through generations, reflecting true friendship, loyalty, paranoia and ultimately betrayal. One of my favourite books of all time. That's not an easy list to get on! Very well narrated. Fantastic book and fantastic delivery from SB. 40 hours was not enough. I still wanted more when it was done. What made the experience of listening to The Company the most enjoyable? What other book might you compare The Company to, and why? What would have made The Company better? What was one of the most memorable moments of The Company? So I’m a big sci-fi and fantasy reader/listener but felt the need to broaden my horizons as everything was getting a bit samey. This was my first venture into a completely different genre and I loved it! The story was excellent, the characters interesting and their development smooth and well transitioned from decade to decade. The narration was good, with appropriate accents and differences between characters. Overall, a really interesting and enjoyable listen. 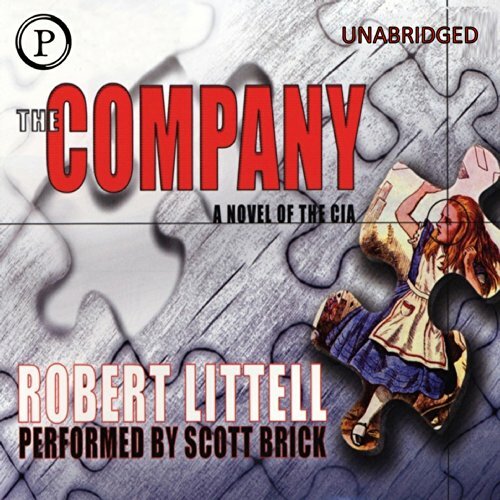 For some years I've extolled the virtues of Robert Littell's THE COMPANY as a simply stunning CIA novel. As someone who divides his time between the written word and audiobooks, a couple of years ago - in my ignorance - I inadvertently bought the abridged audio version of the book that, nonetheless, was a 17-hour listen. I only recently discovered there was a massive 41-hour unabridged version available and went ahead and purchased, hoping that the additional material would not just be unnecessary padding ... it certainly isn't. Narrated by the excellent Scott Brick, this hugely extended version never once fails to hold the attention and I can't recommend it enough for those who enjoy the listening experience. I know I shall return to it again and again. I don't think I've ever listened to such a long story but I didn't want it to end. It's a tour de force tale of the CIA and the Cold War from 1946 to 1995, with fascinating characters and convincing plot lines. The narrator, Scott Brick, is in a class of his own - simply amazing. He tackles various languages, accents, male/female voices, with astonishing fluency. Truly the best narrator I've ever heard on Audible books . I'm very picky about narrators and have returned several books for refunds because of poor performances. Why do they happen - isn't there an editorial panel to weed out the hopeless voice actors? Definitely my top pick of 2017. You won't regret buying this gem. Fascinating storyline with an authenic edge. 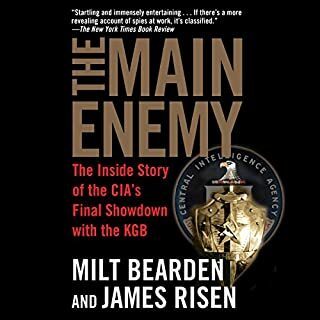 Detailed and at times intense ( and not too sentimental) description of US involvement in recent world events as seen through the eyes of a group of friends employed by the CIA . Given it is 42 hours plus and there a few characters and plot lines, I recommend it as a great holiday read . Good for modern history buffs who like a blend of non-fiction and fiction .